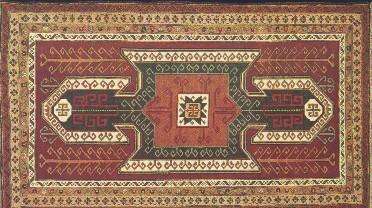 Kars located near the Russian border in Turkey, produces carpets designed in the aucasian style. The main motif used is the large crucilorm. The quiet olive-green combin&d with~a dull red-brown and lighter beige tones give the piece an enormous warmth. The eight stylized trees of life in the corners are surrounded by a Caucasian calyx-and-leaf border and the guard stripes are called 'running dogs." The extremely valuable hand-spun mountain wool is used in the hand weaving and is especially prized by acknowledged buyers. Natural dyed wool is used with the dominate cdours navy blue, red and cream. There are 200.000 knots per square meter in Kars carpet's and for this reason Kars carpets are so noted fine works of art.